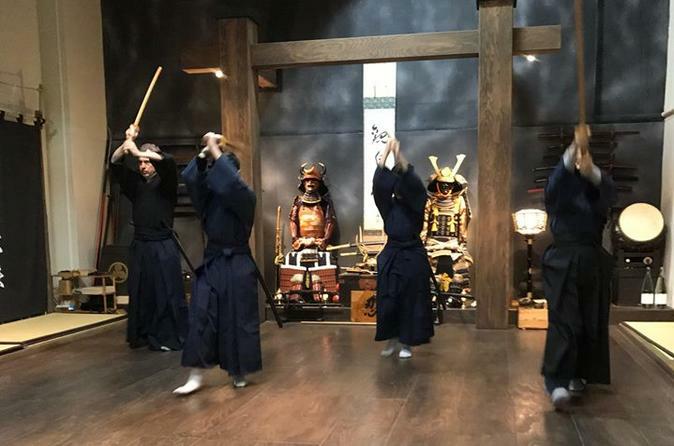 With this workshop, you can learn the authentic way of samurai sword techniquse and the shuriken (ninja star) throwing at the Musashi Clan Dojo. Through this experience, you'll also gain a historical insight into both ninja and samurai traditions. Choose either a samurai hakama or the ninja attire to wear if you like. We introduce the history of our clan at first to understand our background. Our ancestors were awarded the title of Jikisan Hatamoto (The highest class of warrior that was allowed to meet and receive orders directly from the shogun) by the Tokugawa Shogunate and served the government for 265 years. You will gain an insight into this art and tradition that has been handed down generation to generation and see what underlies in the Japanese culture. True warriors know that the most essential part of training is sharpening your sensitivity to avoid danger in order to avoid unnecessary sword fighting. To be able to develop this sensitivity, one needs to learn to control one's ego. Upon changing to gi and hakama or to a ninja attire, you'll learn the proper manner for entering the dojo, the etiquette for beginning and ending class, how to throw shurike n(ninja stars) . Our objective to practice shuriken is to control our minds. Using a bokken (wooden sword), you will learn the most basic half body stance (hammi), etc. and how to move and cut diagnally, horizontally and parry. shown in the above mentioned movie. Training is subject to change depending on the level of the student's skills.